Rev. Theodore M. Hesburgh, C.S.C. The University of Notre Dame will celebrate a special Mass on Thursday (May 25) to mark the 100th anniversary of the birth of the late Rev. Theodore M. Hesburgh, C.S.C., the University’s president from 1952 to 1987 and one of the most influential figures of the 20th century in higher education, the Catholic Church and national and international affairs. Rev. John I. Jenkins, C.S.C., Notre Dame’s president, will preside at the Mass, which will begin at 5:15 p.m. in the Basilica of the Sacred Heart. Rev. Austin Collins, C.S.C., religious superior of Holy Cross Priests and Brothers at Notre Dame and professor of sculpture, will deliver the homily. All members of the campus and local communities are invited. Father Hesburgh died Feb. 26, 2015, at age 97. 16 presidential appointments – from Presidents Dwight Eisenhower to George W. Bush, including the Commission on Civil Rights, Presidential Clemency Board, National Science Board, Commission on the Holocaust and Select Commission on Immigration and Refugee Policy. Father Hesburgh was born May 25, 1917, and raised in Syracuse, New York. He was educated at Notre Dame and the Gregorian University in Rome, from which he earned a bachelor’s degree in 1939. He was ordained a priest of the Congregation of Holy Cross, Notre Dame’s founding order, in 1943. 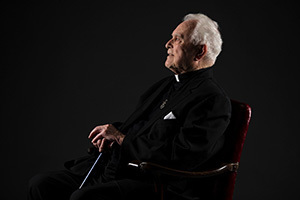 Following his ordination, Father Hesburgh continued his study of sacred theology at the Catholic University of America in Washington, D.C., earning his doctorate in 1945. He joined the Notre Dame faculty the same year and served as chaplain to World War II veterans on campus in addition to his teaching duties in the Religion Department. He became the head of that department in 1948, and the following year was appointed executive vice president in the administration of Rev. John J. Cavanaugh, C.S.C., the University president. At the age of 35 in June 1952, he was named the 15th president of Notre Dame. The accomplishments of the Hesburgh era at Notre Dame are reflected in statistics comparing the Notre Dame of 1952, when Father Hesburgh became president, with the University he left in 1987. The annual operating budget rose from $9.7 million to $176.6 million, the endowment from $9 million to $350 million, and research funding from $735,000 to $15 million. Enrollment increased from 4,979 to 9,600, faculty from 389 to 950, and degrees awarded annually from 1,212 to 2,500. Two major changes during the Hesburgh era were the transference of governance in 1967 from the Congregation of Holy Cross to a two-tiered, mixed board of lay and religious trustees and fellows, and the admission of women to undergraduate studies in 1972. Originally published by Dennis Brown at news.nd.edu on May 22, 2017.